Yes, I’ve been there before, but I don’t mind going back. When Kate mentioned she’d be spending time in northwestern Washington, I started thinking about appropriate first Cascade peaks, and almost immediately settled on Eldorado. 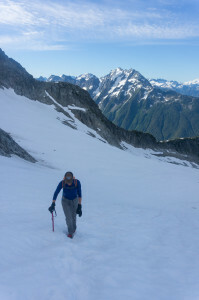 It has all the key elements of a classic Cascades peak — lush forest, alpine heather, spectacular scenery, and a big glacier — without long trail miles, tedious bushwhacking, or tenuous choss-and-moss scrambling. 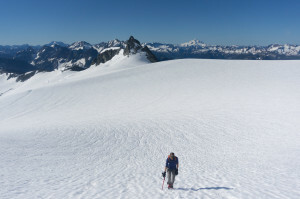 It can also innoculate against the mindless orthodoxy of always roping up on glaciers: while the Inspiration and Eldorado glaciers are heavily crevassed in places, the route itself is both obvious and crevasse-free. For someone with the good fitness and snow-travel skills, a one- or two-day trip up Eldorado is the perfect introduction to the Cascades. After picking up a permit and cooking lunch, we drove up the dusty Cascade River Road to the large trailhead, availed ourselves of the fantastically-clean outhouse, then started across the old logs and up the “super-secret” Eldorado Creek trail. The Marblemount ranger had mentioned that the area had seen a lot more traffic lately, and the trail was much more beaten-in than when I had visited in 2010. 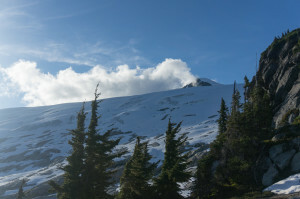 While the straight-up climbers’ trail can be hellishly hot in the afternoon, temperatures were mostly reasonable, with gradually-increasing high clouds blunting the sun’s force. Partway through the boulder-field, we passed a group of three returning from a 5-day expedition way the heck across the glacier to Austera and Primus. 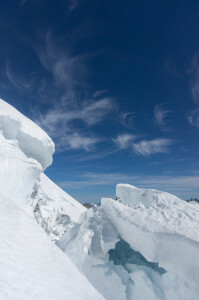 They looked worn down, having gone in heavy with both glacier and rock gear, and warned of calf-deep mashed potato snow. We under darkening clouds up the heather section, watching far-off Glacier Peak disappear behind a curtain of rain. This section was at least as dry as when I last visited in August 2013, and showed the impact of more traffic and less snow-cover. With the ground snow-free for more months, and more parties visiting, the trail is a deepening trench. At the crest of the ridge over to Roush Creek and the Eldorado Glacier, we paused to wait out some light sprinkles. My original plan had been to camp at the flat spot on Eldorado’s bare east ridge, which has great view and early sun, but that looked cold to us in our damp state, so we decided to set up camp. Used to rushing through this kind of area while commuting between trailhead and rock or snow, I was more comfortable than I had expected lazing around with a map and some snacks while the clouds thankfully dispersed. I am relatively unfamiliar with the peaks south and east of Cascade Pass, and never get tired of looking at Johannesburg. We engineered a “couch” out of camping pads to have dinner and watch the sun set on the pass, then found some bare patches of ground to sleep. This high up and far north, it is only truly dark for about 6 hours at night; I woke a bit after 4:00, opening my eyes to face a mosquito patiently waiting outside the netting of my bivvy. We eyed each other for awhile, then I drifted off into my thoughts for awhile before emerging lazily around 5:00. It wasn’t cold enough for the snow to have completely hardened overnight, so there was no advantage to tromping around the cold dark. After a leisurely hot breakfast, we spread our sleeping stuff out to dry and took off for the base of the snow. 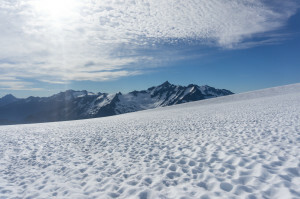 Ascending the snowfields and the edge of the Eldorado Glacier, we found a variety of up- and down-bootprints leading to and from the broad ice plain south of the peak. As we topped out on the plain and into blessed direct sun, we saw a group of three early-starters on the ridge near Eldorado’s summit. The view of the steep Forbidden and broad Inspiration Glaciers draining into Moraine Lake, and the ridges of Forbidden and Klawatti behind them, is revelatory to someone only familiar with the small glaciers and snowfields of the Sierra, Colorado, and Wyoming. Though my time spent in the Cascades and Canada has dulled the “wow!” factor for me, I still remember the impression of my first visit. Short-cutting through a gap in the ridge, we started up the bare talus left of the Inspiration Glacier toward the summit. The group of three we had seen earlier soon passed on their way down, roped together and fully kitted-out with crampons, axes, and helmets on the moderate snow-slope. We later learned that they were a guide and two clients on a course, so I suppose it was practice. Still, in practical terms, it was hard to see the point of all the gear on a slope so shallow and soft that it would be impossible to glissade without “rowing” with one’s axe. Where the snow became easier than the rock we switched over, using the group’s downward bootpack where possible while kicking steps up the slope in running shoes. 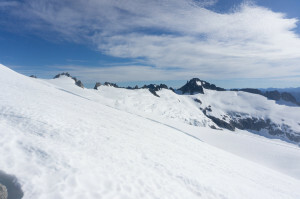 Feeling an urge to sight-see, I wandered over to look into some of the small crevasses near the ridge, where the glacier is pulling away from its edge. A couple were decent-sized, but most were a jump wide and not too deep; still, it was fun to look down through the layers to the hard blue glacial ice. After more trudging, a final bit of steep step-kicking got us to the base of Eldorado’s distinctive and improbable summit snow-fin. Though she had been on plenty of steeper snow in the Tetons, Kate found this exposed ridge fairly intimidating, especially the prospect of descending it. It is a lot less risky than it looks, but it wasn’t hard to make myself picture tripping off one side or the other and sliding helplessly into the void. Exposure is strange and individual in how it creates unwarranted security or fear: I remember my rush of adrenaline induced by the convex drop of the south side of Mount Russell’s east ridge when I first climbed it in 2007, and how it seemed irrelevant on the reassuringly broad ridge when descending it in 2010. After a few minutes of what I hope wasn’t undue peer pressure, Kate carefully kicked her way up to the summit and, after a demonstrated lack of me dying, continued on to the rocks to the west. Dark, sunny, and warm, these rocks nevertheless lacked a crucial feature: comfortable seating. While Kate dug out the summit food, I set about constructing a south-facing bench next to a convenient backrest. Flagstone job done, we sat back to enjoy sardines and salami on slightly-stale bread, tearing them apart with our hands and teeth for lack of utensils. It was windless and t-shirt warm, and we had the aural and visual world to ourselves for awhile, until two more groups of three started making their (roped) way across the ice plain. 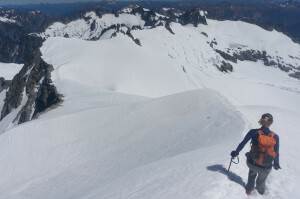 After watching them for awhile, we abandoned our perch for the manageably-intimidating descent of the snow fin, and some plunge-stepping and boot-skiing back down along the ridge. Back at camp, I found my sun-baked sleeping bag smelling better (or at least less bad) than it has in a long time. We were fortunate to have made the climb when we did, as the oncoming heat-wave would have been truly brutal on the south-facing afternoon climb through the dark boulder-field. I pitied the suckers we passed on the way down, and felt warm enough to overcome my aversion to cold water and rinse off in the Cascade River for all of 30 seconds. 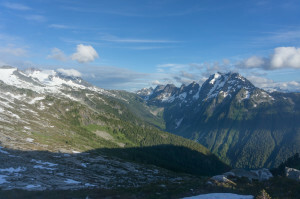 This entry was posted in Backpacking, Washington. Bookmark the permalink. Nice! I’m glad you two got to do that one together. “…demonstrated lack of me dying…” — priceless! May I quote you? Nevermind, I think I just did.